The final match of prestigious 64th B N Mullik Memorial All India Police Football Championship will be played on 17th January 2016 from 1305 hrs to 1530 hrs at Teesta Stadium, SSB Campus, Ranidanga in Siliguri. 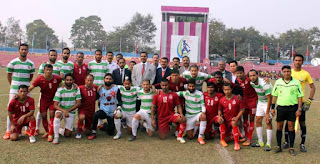 Today two semifinal matches were held in which SSB played with Punjab Police at Teesta stadium SSB Ranidanga while BSF played with Nagaland police at Town Club Ground, Jalpaiguri. Punjab Police won the match after a long struggle with SSB by 1-0. BSF beat Nagaland by 2-0 in another seminfinal match played at Town Club Ground, Jalpaiguri. P K Tihari and Kamal Kishore kicked a goal at 9 minutes and 25 minutes respectively to lead the BSF team to final. Now, Border Security Force and Punjab Police will play the final at Teesta Stadium, SSB Campus Ranidanga on 17th January 2016 at 1300hrs for lifting the Trophy of 64th B N Mullik Memorial All India Police Football Championship 2015. Shri Kiren Rijiju, Hon’ble Minister of State for Home, Govt. of India will be the Chief Guest of the Closing Ceremony. Renowned footballer & former Skipper of the Indian football team Shri Baichung Bhutia & P. Renedy Singh will grace the occasion as Guest of Honour during the closing ceremony. The elaborate arrangements have been made on behalf of SSB Siliguri Frontier to organize final match and closing ceremony of the 64th AIPFC-2015 at Teesta stadium on 17th January 2016. Doordarshan (Sports Channel) has agreed to telecast the final match along with the Closing Ceremony of the championship. Punjab Police Vs BSF to play 64th B N Mullik Memorial All India Police Football Championship final - will be played on 17th January 2016 from 1305 hrs to 1530 hrs at Teesta Stadium, SSB Campus, Ranidanga in Siliguri.